The great debate that has plagued our society over the past few months has been this: Is a hot dog a sandwich? Now the answer is clearly “no”, but I find it interesting that nobody has wondered about whether a cheeseburger is a sandwich or not. 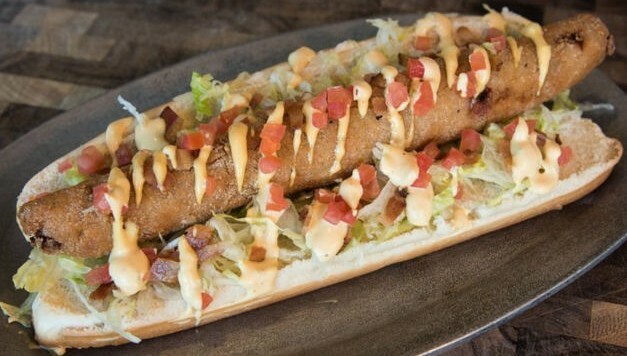 Well don’t bother, because the Arizona Diamondbacks want you to skip over that and argue over a new controversy: The Cheeseburger Dog. The Cheeseburger Dog, made from char-grilled hamburgers, is deep-fried and served with bacon, lettuce, tomato & our house-made secret sauce. I know you might not agree with me, but the world needs this. The world needs a great cheeseburger dog. First off, because why not. Second, because 7-Eleven sells a cheeseburger dog. You know, it’s an oasis in the desert of “I’m starving and I don’t feel like cooking.” But you spend the next couple of hours re-assessing every life choice you’ve ever made. This is an indisputable fact. Sure, I’d have to fly to Arizona to get this version of the cheeseburger dog, but even with the money I would spend on air fare, lodging, game ticket, and said cheeseburger dog, I’d regret that decision less than the one I would make going across the street to 7-Eleven.